Bill Cartwright Taking USF to New Heights, Again! SAN FRANCISCO – The first time Bill Cartwright climbed these stairs was some 41 years ago, when the long-limbed freshman out of Elk Grove High School didn’t just walk up the steep incline. 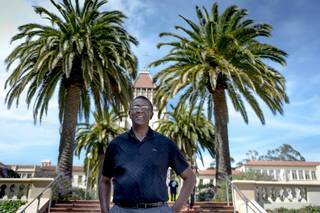 Elk Grove native and former NBA player and coach Bill Cartwright was a basketball star at USF, and is now the school’s new director of special initiatives.